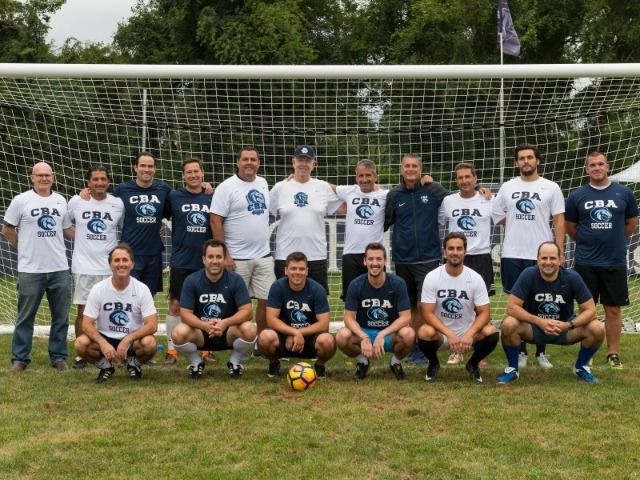 Christian Brothers Academy Soccer held its third annual Keane Cup on Saturday, welcoming alumni back to the field where they once starred. The festivities kicked-off with a showdown with prep school stalwart Peddie School. Coming off a win over Delran to open the season, the Colts dominated Peddie from start to finish, winning 5-0. Senior Jack Gill had a goal and an assist, while Dominic Bellomo, Charlie Daly, and Zach Gilgio each added a goal. CBA also benefited from one own goal from Peddie. After setting a program record for shutouts last season with 16 in 24 wins, CBA has shutout their first two opponents on the young season. Once the varsity contest ended, the alumni Colts took the field for an old-fashion Blue vs. White showdown. While the weather was dreary and damp, the alumni game was a hotly contested contest, needing a game-winning goal from former all-state selection Ken Santos '88 to seal the victory for the White team. Best of all, legendary head coach Dan Keane was on the bench to give some classic encouragement to his former players. The five-time state championship coach has been a welcome presence around the soccer program since his retirement in 2015. Alumni from the 1982 season through the 2000's played in the game, including past all-Shore selections Robbie LaRocca, Scott Beatty and AJ Colantoni. Coach Dave Santos '85 suited up for the White team as well. After the players could catch their breath, the alumni were treated to a post-game BBQ to close out the day's festivities. "It is always great to reconnect with these guys every year," head coach Tom Mulligan '83 said. "Many of these alumni have continued to stay match-fit and have retained a high level of skill, so it's a fun game to watch. Best of all, the alumni enjoy laughing and talking with Coach Keane, who had such a positive influence on their high school careers."